Last week, Mary and I were privileged to be invited to Windsor to see the University Players perform David's adaptation of The Seagull. David was the Writer-in-Residence in the English Department at the University of Windsor in 2008-2009, and he loved it there. 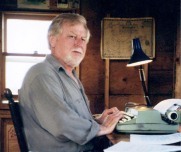 Right from the beginning, the Windsor-ites made him feel at home, and he was greatly impressed by the number of talented writers and actors that he met during his time in the city. 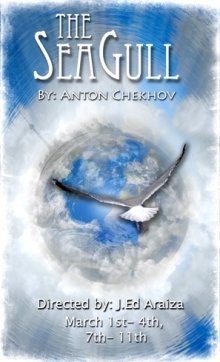 I was delighted to be invited to see The Seagull, but to be honest, I expected to see a high-quality, but typical, student production. As soon as the lights went down and the actors walked into the birch forest, I knew I'd been mistaken about that. I was completely blown away by the University Players show! It was an absolutely splendid production in every way. The ensemble of young people had taken Chekhov's characters deep into their bones, and their performances shimmered. It was an astonishing night in the theatre, a superb interpretation of the work. The show was directed by J. Ed Araiza, a director, writer, and performer who is associated with New York City's SITI Company. It starred twenty-five accomplished actors and four gifted musicians who wove a spell over the audience, and moved us to laughter and to tears. Lionel Walsh, the head of the Drama Department, tells me that U Windsor has produced six David French plays over the years. At the party afterward, I talked to so many people who had been influenced by David's work, and who had enjoyed getting to know him. The show itself was dedicated "to the memory of our dear friend David French." I'd like to thank everyone involved in the show for their beautiful work, and to thank all of David's Windsor friends for everything they did for him. A particular thank you to Lionel for inviting Mary and me, and for taking such good care of us. The city holds a special place in our hearts, and the memory of The Seagull will remain with us always. Glenda, thank you for the lovely blog note.